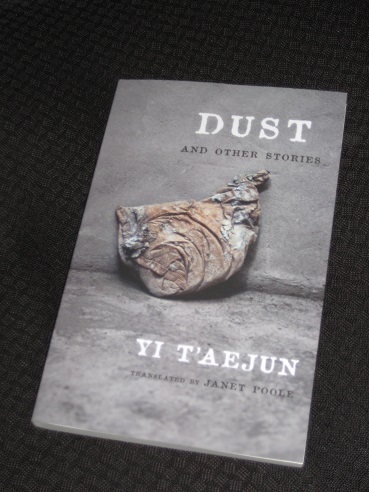 Yi T’aejun’s Dust and Other Stories (translated by Janet Poole, review copy courtesy of the publisher) is a collection of stories spread over a quarter of a century, spanning the colonial era and the first, tumultuous post-liberation years. This was a period when most Koreans faced hardship and tough choices, and Yi was one of the many writers to have made the decision to head North when the moment to take sides arrived. Poole’s introduction discusses his decision, and his reputation, noting that it’s unlikely the writer’s life had a happy ending. Dust is a collection with a number of contrasting styles and topics, with a couple of lighter pieces included. One example is the early story ‘Omongnyo’, in which a young woman married to an old blind man plays a dangerous game, two-timing a fisherman and the local police officer. In the later piece ‘Tiger Grandma’, a small village attempts to persuade the stubborn local matriarch to learn Hangeul so that they can achieve their goal of a 100% literacy rate. While she initially resists, the cunning villagers appeal to her pride to persuade her to start her studies, with happy, heart-warming results. Yi’s stories record that sense of loss at the same time that they explore the new spaces and experiences of colonial Korea: its capital city, Seoul, where Yi lived; provincial cities, such as Pyongyang and Kyongju, that were undergoing the first wave of imperial tourism; and destitute rural villages, which provoked an intense sense of nostalgia in the urbanite Yi. Examples of this include ‘The Broker’s Office’, looking at three old men left behind by the modern world and their vain attempt to hit the jackpot, and ‘Unconditioned’, a story showing how a writer’s attempts to return to his youth are dashed when he discovers his home has changed beyond recognition. A longer story continuing this theme is ‘The Frozen River P’ae’. Here, a writer called Hyon (Yi’s alter ego) returns to his hometown of Pyongyang after a long absence and is amazed at the changes he finds. Many buildings have risen and disappeared, but the biggest differences he notices concern the inhabitants. The headscarves the city’s women used to wear have vanished, and the Seoul accent has suddenly become more prevalent. The worst changes, though, are to be seen in the people the writer catches up with, with little common ground evident between the formerly close friends. It’s still only eleven o’clock, but if I were to go now to Nangnang or the Myongch’i Bakery I would probably find Yi Sang or Kubo, sporting far thicker beards than mine and sitting looking bored in front of coffee cups, being free from employment as they are. If I were to walk in, they would greet me enthusiastically, as if they’d been expecting me. And maybe they would even tell me a story or recommend something they had recently read to stimulate my creative impulses, which are now also covered in spores of mold. Most of the stories here display elegant writing, and thanks to Poole’s excellent work, the leisurely flow of the stories is reflected in the English versions. One notable example is ‘Evening Sun’, a slow-burning tale of the cautious relationship that develops between a middle-aged writer and the vibrant young woman he meets on a journey to Kyongju. It’s a surprisingly tender love story with a bitter-sweet ending, and a rare moment of escape from the political issues of the time. However, Yi’s fate is a shadow that looms over the collection, and some of the final stories provide insights into the dilemmas he, and the nation, faced in the 1940s. ‘Before and After Liberation: A Writer’s Notes’ is a two-part story, and in the first there are shades of Ch’ae Manshik, with the writer attempting to avoid being used for propaganda purposes by the Japanese. However, when liberation does arrive, the confusion and infighting between the nation’s writers brings even greater problems. The visions of a united country arising from the trauma of Japanese occupation have been shattered. It’s time to pick a side, with the knowledge that making the wrong decision may prove fatal. ‘Dust’ is probably the best depiction of the chaos of this period that I’ve seen in Korean literature. While the action is coloured by Yi’s preference for the north, the story shows the stark difference in attitudes between the two sides, as well as opening our eyes to the way the Americans have changed society in the south. The story highlights examples of brutality by GIs towards locals, as well as exposing the money-grabbing opportunists sucking up to the foreigners. While modern readers may struggle to understand Yi’s decision, it’s little surprise that having compared the sense of community back in Pyongyang with the vicious free-for-all Seoul had become, the writer finally opted for life in a socialist regime.